Kevin Garnett, who spent 12 seasons with the Timberwolves (and holds franchise records for games played, minutes played, points, field goals, field goal attempts, free throws, free throw attempts, offensive rebounds, defensive rebounds, assists, steals and blocks), played his first game with Minnesota since being reacquired at the trade deadline. The night included a memorable tribute video (LeBron James was impressed) and some serious nerves from the T-Wolves players, who started the game shooting 0-for-9. The team calmed down and cruised to a 97-77 victory over the Wizards. 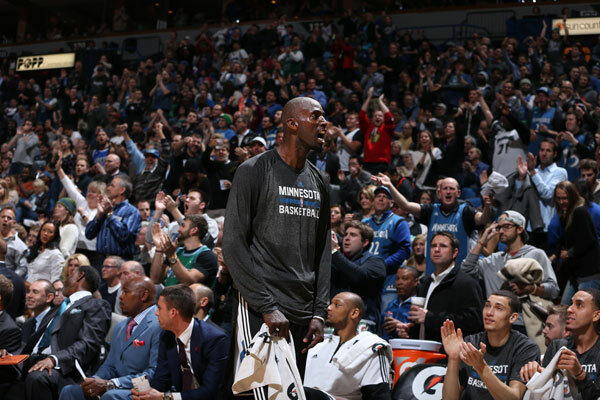 All in all, it was a great night for the Timberwolves, their fans and this random shirtless guy. The synopsis for the new Rocky movie has leaked and the film doesn't look that bad. In a nutshell, he reluctantly trains Apollo Creed's son while battling some type of sickness (or as they call it, "an opponent more deadly than any he faced in the ring."). It also features Phylicia Rashad ​(a.k.a. - Clair Huxtable). One thing we can guarantee: It won't be the worst sports movie of the year. Did you know former Bachelor and ESPN analyst Jesse Palmer is from Ontario? Small programming note: Due to popular request, I'm switching Thursday's Throwback LLOD from P.M. Clicks to A.M. Clicks. And as luck would have it, Ali Larter (of whipped cream bikini fame) turns 38 on Friday. She earns today's honors (click here for full-size gallery). Yes, this is a thing. The cups are made out of cookies “wrapped in sugar paper and lined with a layer of glorious white chocolate.” Unfortunately, they are only available in the UK. What Did The Chair Do To You? Barry Switzer traded in his Mercedes for a Kia ... Adam Lind took a shot at former Blue Jays teammate Colby Rasmus ... Nick Markakis doesn't have great things to say about his former team, the Orioles ... ESPN's 30 For 30 will cover the Von Erich family and its various tragedies ... The Cubs are all set with Sammy Sosa ... Congrats to the Afghanistan cricket squad ... FSU guard Xavier Rathan-Mayes scored 30 points in the final 4:38 of Wednesday's 81-77 loss to Miami ... Chris Jericho will appear in the latest Sharknado movie ... Public stairwells adorned with colorful street art ... Newlyweds injured in the Boston Marathon bombing are separating ... Nothing to see here. Just a bunch of monks having a snowball fight ... Google Earth is the best. The Capitals and Penguins brawl near the bench during last night's game. The singer fell from the steps of a stage during a performance at the Brit Music Awards. Finally saw the Bob Marley documentary last night. It was excellent. Here's my favorite of his many great songs. Click here for previous versions of Hot Clicks, visit our Extra Mustard Page every day for more quirky sports stories and the latest NBA Cheerleaders gallery, and please take a look at The Daily Cut, our new live and on-demand video platform.